A staple of the Leaf brand, 2017 Leaf Best of Football follows a formula that involves a variety of repurchased cards from the sport. In addition to a buyback in every box, collectors can find an Offensive Rookie of the Year Predictor insert. 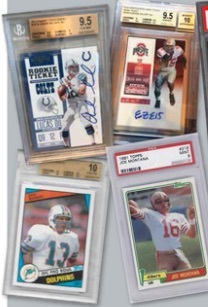 Concentrating on the all-time great cards in the hobby, including key rookie cards, autographs and memorabilia cards in graded form, the 2017 Leaf Best of Football checklist is loaded with top-level talent across multiple decades of the NFL. This includes options for Hall of Fame players, current superstars and young players on the verge of greatness. 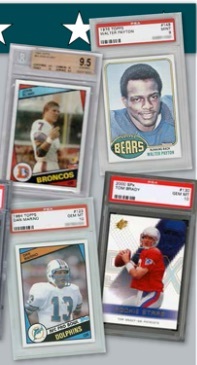 Although the buyback football cards are the most likely pulls from boxes, Leaf also revealed that there are redemptions in play "for a few surprises." Also, the official box output is noted as one buyback card or item. Joining the repurchased cards in 2017 Leaf Best of Football are Offensive Rookie of the Year Predictor cards at one per box. These new inserts cover the 2017 NFL Draft class and allow collectors to redeem it for a signed memorabilia item if the depicted player wins the AP Offensive Rookie of the Year award. Subjects include top players from the draft along with the generic "Field Card," which acts as an overall wild card for anyone not specifically named in the set.